The Crawford Fund has made a submission to the current inquiry by the Joint Standing Committee for Foreign Affairs, Defence and Trade into “The role of development partnerships in agriculture and agribusiness in promoting prosperity, reducing poverty and enhancing stability in the Indo-Pacific Region”. Our submission emphasised that Australia and its developing country partners in the Indo-Pacific region have benefited substantially from decades of global and Australian investment in international agricultural research. It also highlighted that recent Crawford Fund studies confirmed that agricultural research for development not only continues to strengthen food and nutrition security in developing countries, but that it also benefits Australia and Australian farmers. Each partner should meet the costs of its own participation; this is based on a belief that the private sector will participate if it sees such participation as consistent with either its corporate business objectives and strategies and/or its corporate social responsibility objectives and strategies. Aid funding should focus on policy advice and dialogue to help to build a policy and regulatory framework that encourages worthwhile investment by the private sector and on capacity building in the developing country; funding deemed essential to initiating partnerships may also be provided by the aid program. Outcomes of research funded by aid funding or the public sector should generally be in the public domain, although where the research is co-funded by the private sector, special conditions (such as making the research outcomes available under license to developing country agencies) may be applied. Some time back, Denis Blight, our chief executive (pictured), was interviewed by freelance journalist, Lisa Cornish about the inquiry and the Fund’s submission. Lisa’s report follows. Fifty submissions have so far been received into a new Australian government inquiry into the aid program which aims to provide recommendations on better utilising partnerships with the agricultural sector to reduce poverty and promote health in the Indo-Pacific region. The inquiry, titled “The role of development partnerships in agriculture and agribusiness in promoting prosperity, reducing poverty and enhancing stability in the Indo-Pacific Region”, is nearing its final stages following six public hearings held in Canberra and Sydney during February and March. “In our immediate region, Indo-Pacific in particular, we have some of the world’s worst stunting amongst children,” Dr Sharman Stone, Sub-Committee Chair for the inquiry, told media. In calling for the inquiry, Foreign Minister Julie Bishop asked that the committee, consisting of elected representatives from various political parties, examine the role of current and potential development partnerships in the food and agriculture sector with a range of stakeholders. This includes the business sector, civil society, the research and academic community, industry bodies and governments. The inquiry follows a recent review into engagement of the private sector which produced the report “Partnering for the Greater Good”, encouraging greater collaboration between the Australian aid program and the private sector for improved development outcomes in the Indo-Pacific region. A range of NGOs, including ActionAid, CARE Australia, Crawford Fund, Fairtrade and Word Vision, have all made submissions. “We welcome these opportunities that enable us to contribute our ideas,” Molly Harriss Olson, CEO of Fairtrade Australia New Zealand, said. Fairtrade bring a rage of expertise to their submission, including expertise on engaging with businesses and empowering women in community decision making. “In terms of impacting on nutrition and health, a key finding of ours is how important it is that women are empowered to make key decisions with income as it is generated,” Harriss Olson said. Denis Blight, Chief Executive of the Crawford Fund, explained that their submission looks deeply into issues effecting developing communities with budgets a key factor. A key part of the financial discussion, Blight said, should be the extent of involvement from the private sector. 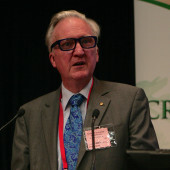 But he also wants the inquiry to raise the question of Australia’s involvement in innovative agricultural research, not just to benefit developing communities but Australia and the world. The inquiry is still accepting submission which will assist the committee to understand Australian achievements to date, options for agricultural innovation, ways to improve health, ways to improve women’s economic empowerment and how to better incorporate small developing-country entrepreneurs in the agriculture and food value chains. “Unless we really get engaged with that food, nutrition development side of business, then it’s not much good talking about giving you better telecommunications when most of the people on your island are concerned about their children not having proper nutrition, or the adult’s life expectancy reducing and a lot of the health budget going on non-communicable diseases,” Dr Stone told media. Recommendations and a report from the inquiry are expected to be made to the Foreign Minister and the Department of Foreign Affairs and Trade (DFAT) prior to Australia’s next federal election. In early May, the Joint Standing Committee on Foreign Affairs, Defence and Trade Foreign Affairs and Aid Sub-Committee tabled in Parliament its first report, entitled ‘Food for thought: Improving health and nutrition in the Indo-Pacific region’. The Committee’s inquiry has now been completed and its report, which makes four recommendations, is available to read on the Committee’s web page at this link.